Aqua tiles may seem like a far-fetched, design challenge. 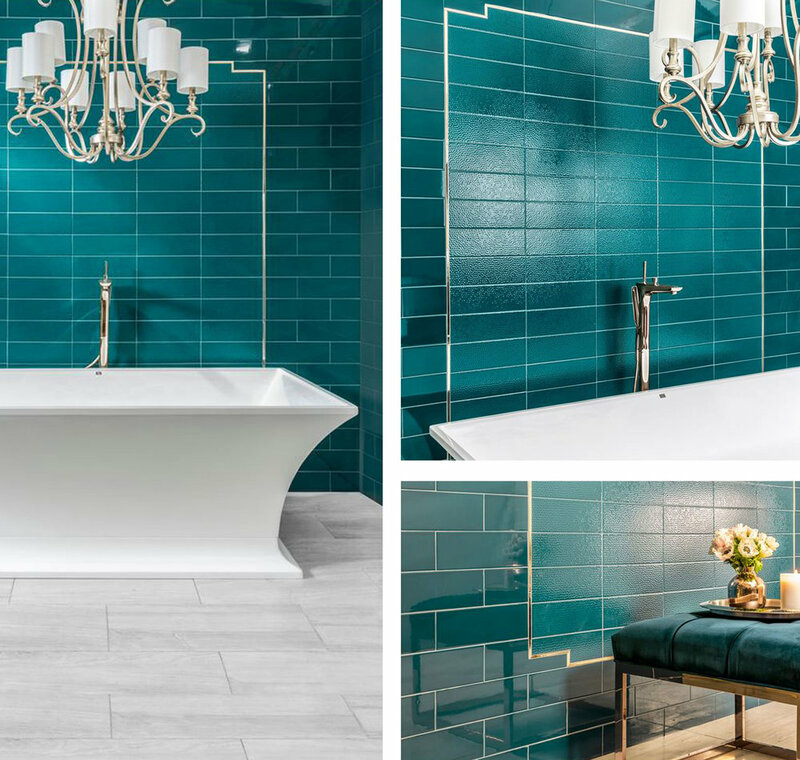 However, as tiles and green-er inspired interiors surface among industry blogs and portfolios, one thing is for certain: tiles and aquas are here for the long haul. So, let's celebrate. For, these lagoon hues inspire interior oasis' and timeless charm. But, more importantly, they aren't as audacious as you might think. Let's face it, the bohemian interior trend feels inescapable at this point. Subsequently, if we see one more Pinterest board dedicated to the trend, we may scream. Surprisingly though, Justina Blakeney's incorporation of aqua tiles for this bohemian bathroom retreat leaves us wanting more. More so than ever before. How is that even possible? Well, it's Blakeney's "Jungalow" mantra that exhibits more than the typical bohemian. Similarly, the incorporation of two, varied FIRECLAY Tiles allows for a refreshing take on an invariable state. The quality in these tiles revitalizes bohemian interiors for the better. Blakeney opted for the hand-painted Elephant-Star tile in the "cool motif" colorway for the wall tile. In cooperation with Elephant star, the designer chose a complimentary 3X6 "Tidewater" Tile in a herringbone pattern. The herringbone adds an eclectic touch to the bath, shower and floors. In contrast, For those looking to glam up their dining areas, this tile from ADKO adds a sophisticated touch to any home. The "Lagoon" tile engenders opalescent, reflective qualities. Thus, changing a variety of aqua tones throughout the day. Try silver or gold accents to glam up the space. Similar to the glam glam dining nook, this tile collaboration inspires polished, sophisticated bliss. While the first example of aqua tiles fosters jungle ques, this spa retreat entails something different. Designer Matthew Quinn incorporates two textures from ADKO's "tidal" tile collection. The first a hammered, and the succeeding a gloss. The similarly colored tiles add cooling depth through their alternating structures. While the color of the tiles are a statement in themselves, the subtle patterning of the tiles on the walls allow for a clean, polished finish.